President Aquino declares July 17, 2015 as holiday for Eid al-Fitr (Feast of Ramadhan) | #WalangPasok - Balita Boss! 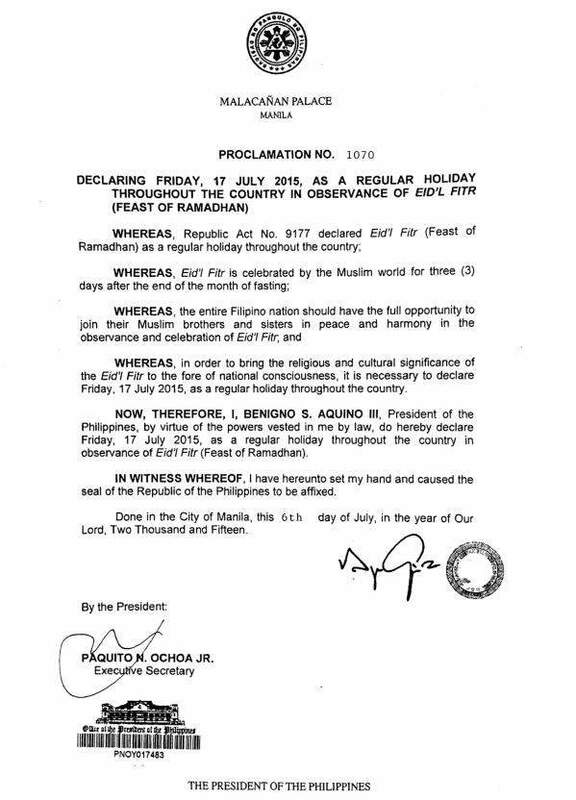 President Benigno 'PNoy' Aquino III on Monday has declared July 17, 2015 (Friday) a regular holiday across the country in observance of Eid al-Fitr or the Feast of Ramadhan.. The observance seeks to encourage the Filipino nation to join Muslim brothers and sisters in peace and harmony in the celebration of Eid al-Fitr, the Feast of Ramadhan. Eid al-Fitr is one of the two greatest feasts of Islam, the other being Eidul Adha, which is also a regular holiday in the country. This year, Eid al-Fitr falls on a Friday, giving Filipinos another long weekend. Classes are suspended during regular holidays while employees are paid in full even if they do not report for work, and paid in double if they do.